For those who follow the blog, you may recall that I had put together a list of resolutions for my photography and my art for 2011. 2010 was really my year for getting my business side of things put together: designing my website, publishing my online portfolios, choosing a web vendor for my web store, getting my branding developed, etc. For 2011, one of my main resolutions and one of my biggest business goals was to tackle selling my fine art prints through local art fairs and markets. I am slowly, but surely getting into this area and I have to tell you, it’s been fun and challenging so far. 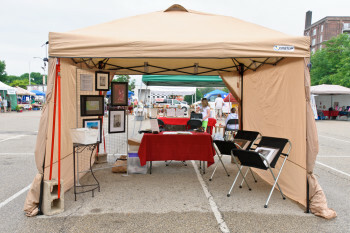 I have covered a whole range of business processes and procedures that I never thought possible including tackling Illinois sales tax and intellectual property laws, figuring out jury selection processes, and trying to figure out the best way to arrange my fine art booth. Well, this past weekend, I headed down to the opening day for the Peoria Riverfront Market and set my booth up for the very first time. I definitely had to scrounge up some supplies and begged and borrowed from a couple photog friends, but, as you can see from my phone shot, I was pretty successful. And, best of all, I actually sold a few prints! Not to mention, the wind gusted plenty and I didn’t end up with a single item blown away or knocked over. While I am only starting out in this endeavor, and I’m sure I’ll post more about this whole thing as it rolls along this summer, I’m very excited and so appreciative of all the support I’ve received along the way from friends and strangers. Greetings! Thanks for making this sort of an informative article. Essentially you might have explained those topics vice versa. However you provided it a friendly personalized spin. Looking foward to going to your site more reguarily.